UPPSC Sahayak Sankhyiki Adhikari Screening Exam date holding from 11 November 2018 in various exam centers where UPPSC Assistant Statistical Officer was announced. UPPSC ASO Syllabus and scheme is written in official webiste. Through Announcement by UPPSC one of officer screening exam date uploaded on 5 October 2018. The Eliiglbity of UPPSC Statistical Officer is already decided you can see what criteria is in downwards. UP Sahayak Sankhyiki Adhikari Qualification: Candidates must be minimum graduate pass with Maths, Statistical Maths, and Commerce, Economics, or Post Graduate degree in Statistics. 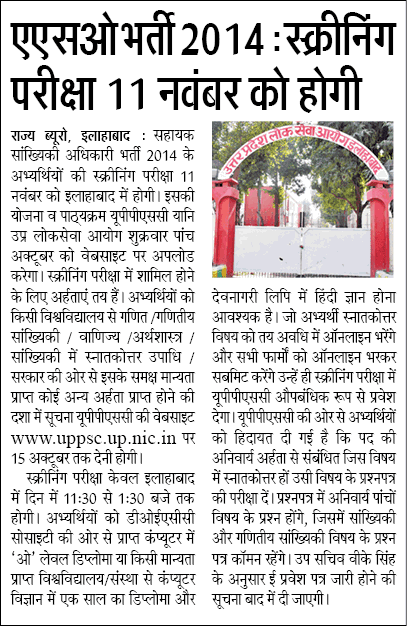 If any type of Eligibility changed in exam of UPPSC Sankhyiki Adhikari we personally update these posts. ASO Screening Exam Date 2018: Sahayak Sankhyiki Adhikari EXAM only centered in Allahabad with 11.30 IS to 1.30 timing. Selection Process: If you interested in filling form of Sankhyiki Adhikari (Assistant Statistical Officer) Vacancy in UP you computer certificate should be level of O level or any Computer Science Certificate of 1 year to apply in UPPSC ASO Recruitment 2018. Maths Stream Students of Statistical Officer will only get paper of UPPSC Statistical Officer Syllabus of Maths stream. Commerce Stream Question Like Above syllabus UPSC ASO commerce Study prepared by you. Admit Card of UP ASO Exam 2014 soon updated on webiste and UPPSC will not wait until produced UP Sahayak Sankhyiki Admit card 2018.